We’re proud to offer 8 pumps of Real ale alongside award winning Pieminster pies. We also serve a local real cider and real perry, a fine selection of wines and spirits along with a good choice of non-alcoholic options. 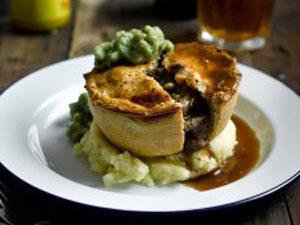 We’re proud to offer 8 pumps of Real ale alongside award winning Pieminster pies. We also serve a local real cider and real perry, a fine selection of wines and spirits along with a good choice of non-alcoholic options including soft drinks, juices and cordials. David Craddock setup the 4bbl Craddock’s brewery in 2011, to quench the ever increasing demand for quality real ale at his two Stourbridge pubs. 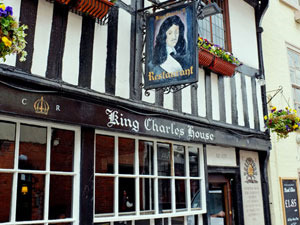 After taking over the King Charles, the demand for his own ales outstriped supply so it became obvious that a much larger brewery was required. In 2013 he setup a brand new 8bbl brewery behind the Kings Head & Stable bar in Bridgnorth and created two new unique brands, Bridgnorth brewery (traditional organic ales) & Two thirsty brewers (modern craft beer). This all makes the King Charles II a unique collaboration between brewers, King Charles House is real ale haven in the centre of Worcester.